Spectacularly located on the famous, shell-shaped bay of the Playa de la Concha, San Sebastian, (known as “Donostia” in the Basque language) is undoubtedly Spain’s most elegant and fashionable seaside resort. It attracts families for its pristine beaches, honeymooners for its countless romantic viewpoints and above all food lovers who arrive in droves both for its dazzling array of Michelin starred eateries (there are more stars per capita in San Sebastian than in Paris) as well as creative tapas and pintxos bars. San Sebastian is a “must see” destination for culinary tours of Northern Spain. Not to mention a fascinating venue for world-renowned art, jazz and films festivals (all of which attract celebrities, you can easily rub shoulders with Hollywood Elite at the town’s fine hotels and restaurants during these festivals). San Sebastian has long been adored by the aristocracy and monarchy of Spain, particularly in the 19th century, the period during which wonderful Belle Époque palaces and hotels like the Maria Cristina were established. And yet what we know today as a chic holiday resort actually began life as a small, nondescript fishing village of little note. Although historians have uncovered evidence of pre-roman settlement, its official history begins with the pre-roman tribe, the Varduli, who it is believed established the settlement shortly before the Roman invasion and occupation of Spain. The Romans controlled what was then known as Iberia from the 2nd century BC to the 5th Century AD. However, their western civilization collapsed in the mid-5th century due to attacks from the Visigoths and other tribes from northern Europe. After the collapse of the Roman Empire, the region languished in obscurity for centuries, little is known about San Sebastian’s fate until the 12th century. Although the Moors from North Africa invaded Spain in 711 and quickly subdued the population in Andalusia (southern Spain), provinces like the Basque country in northern Spain resisted conquest and several territories remained independent from the Moorish territory of ‘Al-Andalus.’ What we do know is that the town was granted self-governing status by the kingdom of Navarra in the late 12th century. The Navarres ruler, King Sancho VI, viewed San-Sebastian with great interest, as the grand sweep of the Playa de la Concha bay was their only access to the sea. Unfortunately, the territory was taken from the Kingdom of Navarra in 1200, after King Alfonso VIII of Castile annexed the region. Gascon-speaking immigrants from the nearby town of Bayonne started to settle in San Sebastian and a thriving trade was built up with other European seaports. A thaw in relations between Castile and Navarra was also initiated in 1265, as a wedding pact involving both regions allowed Navarra access to the lucrative sea-trade of San Sebastian. However, a tragedy would befall the town in 1489, when a devastating fire destroyed most of San-Sebastian’s buildings and housing. From that moment on, the town’s residents constructed their buildings from stone, rather than timber! San Sebastian would see yet more conflict and political turmoil in the coming centuries. After the final fall of the Navarra Kingdom to the Castilians, San Sebastian became a province of the ancient Basque Region of Gipuzkoa. This period of history during the 16th century would see Spain enter many wars with France, Holland, and England under the rule of King Philip II. This period of European conflict took its toll on San-Sebastian, and its prosperity and population declined. Many fishermen took to pirating as a means of surviving, and perhaps growing wealthy! However, in the 17th century some peace and stability returned to San Sebastian, and in 1656 the city was honored to host Maria Theresa of Spain and Louis XIV during their marriage in St Jean-de-Luz on the Basque coast. Its population recovered and the city’s fishing and trading industries once again prospered. The good times largely continued into the 18th century, despite a French attack on the city in 1721. In 1728, a company was founded to benefit from the influx of trade with South America. The wealth generated from this trading endeavor allowed many city improvements to be made and new buildings to be created, including a new Church of Santa Maria. The city’s fortunes declined in the 19th century, as the inter-state conflict would once again engulf San Sebastian. During the Peninsular War between Napoleon’s France and the allied powers of the UK, Spain, and Portugal, many important battles were fought to take control of the Spanish Peninsular. In 1808, the French forces captured the city, which was subsequently retaken by Anglo Portuguese troops three days later. The arriving troops, after fighting to regain the territory went on the rampage, pillaging and setting fire to the city. After this terrible event, the city was naturally rebuilt and many improvements were made to San Sebastian’s fine public buildings. In the mid-19th century, domestic conflict also escalated across Spain, with the various Carlist Wars engulfing the nation. The Carlists were a group who sought to restore an overthrown Monarchy in Spain. San Sebastian, after siding with the Republican liberals was attacked by the Carlists, initially in 1875, who repeatedly shelled the town, killing the resident poet, Bilintx in 1876. However, despite the wars of the 19th century, it is during this period that the initial signs of a thriving tourism industry began to develop in San Sebastian. The first casino was built in 1887 and Spanish Royalty started to visit the city on a regular basis. By the close of the century, many elegant hotels and Art Nouveau buildings had been constructed, giving San-Sebastian a glamour and renown equal to its French seaside cousin, Biarritz. The 20th century would herald many changes, struggles and upheavals for Spain, with San Sebastian often in the direct firing line. During the Spanish Civil War, fiercely pro-Republican San-Sebastian was captured by the Nationalists, who executed more than 380 citizens. Many more fled to neighboring countries, draining the city of its workforce and lifeblood. After the Nationalists won the War, San-Sebastian was in a sorry state indeed, under-populated and poverty-stricken. It was not until after the end of the Second World War, that the city’s economy started to recover in the 1950s. After the death of Franco, Spain converted with surprising ease to democracy and has emerged as one of the most important cultural, economic and political forces in Europe today. San Sebastian benefited enormously from becoming part of an autonomous region once again, notwithstanding the political infighting between different parties in the 1970s and 80s within the Basque political arena. In the 1990s, major urban rejuvenation projects were undertaken, including the enlargement of the beachfront promenade, new university facilities, and public infrastructure improvements. Today, San Sebastian’s timeless appeal and glamour remains, despite the many hardships the city had endured over the last century. For decades, it has held the proud title of Spain’s most famous resort destination, enticing visitors with its surfeit of culture, festivals, unspoiled beaches, and unrivaled gastronomic tradition. 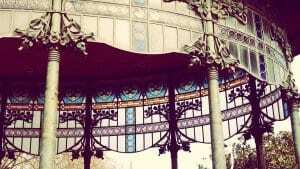 Part of its appeal lies in the Basques, who have maintained their own language and culture over the decade and feel totally separate from their neighbors down south. Indeed, as locals will proudly tell you, you should not really refer to this glorious city as San Sebastian but rather as Donostia, the jewel of the Spanish Basque coast! San Sebastian is renowned throughout Spain for its superlative, Basque Cuisine. And although the Catalans may disagree, there is no denying the formidable food culture of the city and the Basque region in general. 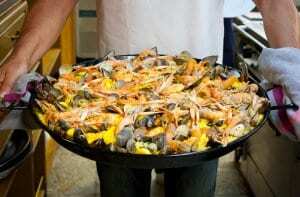 Cuisine has always played an important part in local life: many Basque men in San Sebastian belong to clubs where they gather weekly to cook, eat, drink and talk. All this adds up to a bewildering array of options for the gourmet visitor, both informal and 3 Michelin starred. Restaurants like Akelarre, Arzak, and Mugaritz continue to draw discerning food lovers with their superb interpretations of modern Basque cuisine. Of course, San Sebastian, like every Spanish city has an enormous variety of places to eat and drink and great value eateries abound. Your first port of call should undoubtedly be the city’s old town, called the Parte Vieja. Wedged between the bay and the Urumea River, the alleyways of this delightful old town are packed with informal restaurants and tapas bars. The atmosphere at night is unbeatable, throngs of revelers passing from bar to bar, sharing the Basque pintxos with countless glasses of wine. Local Basque cuisine is always based around high quality, local ingredients in season rather than elaborate sauces or spice combinations. Seafood is, of course, one of the main ingredients in traditional dishes using interesting ingredients including sea bream and hake cheeks. Hake (Merluza) is cooked in a green sauce thickening the juices from the fish, once it has been warmed. Grilled sea bream is usually cooked with plenty of garlic. What of the wine? Well, the Basque country produces Txakoli, a crisp white wine that is perfect as an aperitif. The Basque region of Alava produces exceptional red Rioja wines, but in the city’s finest restaurant you will be able to sample wines from all over Spain and the world! Local Txacoli wines are a young, fresh, fruity, “green” wine with 11% alcohol levels and a strong personality made in Basque Country. These wines are made approximately 30 miles from San Sebastian and consist of 80-90% White Hondarrabi Zuri grapes). Txacoli is one of the smallest and most interesting Appellations of Origin in Spain. Txacoli de Guetaria is the denomination closest to San Sebastian, with 174 hectares of land area. This beautiful square was home to a bullring, and now you can see the orange and blue shutters and the numbered balconies, which used to surround the ring. Beside the plaza is the beautiful Santa Maria del Coro Baroque church. This traditional ritual dance involving swords is performed in various venues but mostly during festivals. The dance involves about 10 to 24 people, who split into 2 groups. One group dances with long swords making bridges and other architectural forms, while the other group dances with shorter swords moving their arms, reminiscent of Asian martial arts forms. The Palacio del Mar was designed by Juan Carlos Guerra, with a unique Basque architectural design and was opened in 1828 as headquarters to the Guipuzcoa Oceanographic Society. Today it is an aquarium with a very unique collection of fish as well as a Basque maritime exhibit. Palacio Miramar was built for Queen Maria Cristina as a summer residence in hopes to establish this area as an aristocratic resort city. 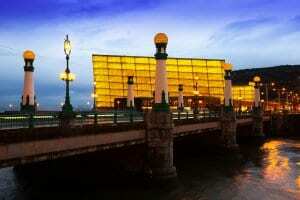 It was built by the Basque architect, Jose Goicoa and designed by a British architect, Selden Wornum. The gardens are open to the public.